Should Your CCTV Camera Be Visible? | Fire Monitoring Of Canada Inc.
Should Your CCTV Camera Be Visible? Safeguarding your business interests from external and internal threats is critical, which is one of the reasons why it makes a lot of sense to install CCTV camera systems. Whether it is criminals who might be tempted to target your property or dishonest employees who might seek to illegally take company property off the premises, you need to be vigilant and ensure that you’re up to the task of conducting surveillance. Even so, where should you actually place your CCTV cameras? While some believe in concealing them so that those being observed would be hard pressed to even know that they’re being monitored, it can be argued that placing your CCTV camera in a way where it is clearly noticeable can go a long way towards deterring illegal and unethical acts. As well, installing covert cameras can run afoul of Privacy Laws such as PIPEDA, and covert cameras should never be installed unless you have consulted with someone who is familiar with these privacy laws. Read on to learn more about what you have to gain by making your CCTV camera systems visible for all to see. CCTV cameras should be placed at the entrances/exits of your business, and it definitely makes sense for you to install them in a way that is clearly visible. Many break-in attempts are crimes of opportunity, but a CCTV camera will give just about any would-be thief enough time for a sober second thought about breaking the law. Moreover, such cameras will also keep your workers honest and on their best behaviour. When monitoring doorways, cameras should be installed opposite of the hinge side of the door. 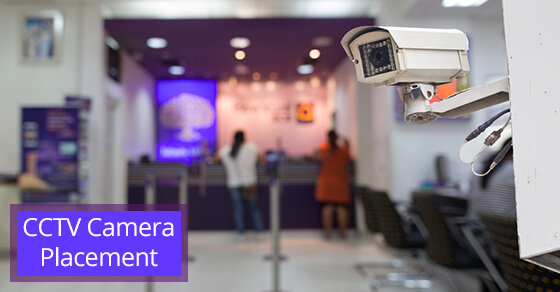 If you have a dedicated reception area — or any area that has lots of foot traffic — then it makes sense to include a CCTV camera in the vicinity. You can keep track of who comes and goes, and a visible camera will encourage good conduct. If you would prefer to have a camera that is not so obvious in your reception or high-traffic areas, consider a low profile camera, or “mini dome”.. Installing CCTV cameras in the office supply and/or storage rooms makes sense if you are concerned about product loss. While you could make these cameras visible, this might be one of those instances where it might be a good strategic decision to install the cameras in a way where they are not obvious, but still visible to your employee.. This will give you the opportunity to safeguard your important documents and supplies while assessing the honesty and integrity of those on your payroll. CCTV camera systems are definitely important as part of your business security strategy. While there are limited cases where hiding some of your cameras might make strategic sense, there are plenty of reasons why you will want to consider making them obvious since they can go a long way towards discouraging anti-social activity. As always, it is important when installing CCTV cameras in your business to consult with your employees and let them know where they are being installed, and their intended purpose. Then, everyone will be on side and the cameras will serve their intended purpose.